Queenie depicts the flooding of the Old Texas homestead in 1922. The homestead (top) is flooded to the roof with dirty floodwater shown as pink, a colour she often used in her ochre on canvas paintings. The hills in the lower right depict the landscape of 'Old Texas'. To escape the rising water, all the stores were taken to higher ground and the people sat around and drank beer, waiting for the waters to recede. 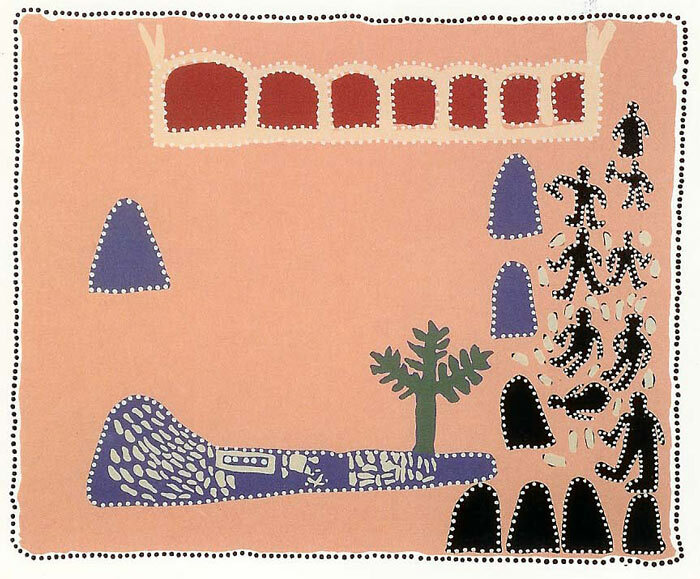 Queenie McKenzie began painting in the late 1980s after encouragement from her friend, Rover Thomas, one of Australia's most preeminent Aboriginal artists. Queenie was born c. 1930 on Old Texas Station, on the western bank of the Ord River in the East Kimberley. Her mother Old Dinah was a Malngin/Gurindji woman and her father was a non-Indigenous horse breaker. Queenie grew up among the Gija people and spoke Gija as her first language. Queenie worked as a cook on cattle stations for almost 40 years until 1973 when she settled in Turkey Creek (Warmun). She was a strong member of the Warmun community; a Councillor and teacher of the Gija language and also played a significant role in the reclaiming of traditional land in the region. She was heavily committed to ceremonial life. Queenie’s artworks depict her country in natural ochres (natural earth pigments), blending landscape with witnessed or remembered events, family anecdotes and dreamtime stories. Her landscapes map the World Heritage listed Kimberley region using dots to delineate colour forms in the style of the Turkey Creek (Warmun) art movement. 2006-2007 - Gifted: Contemporary Aboriginal Art: The Mollie Gowing Acquisition Fund, Art Gallery of New South Wales, Sydney. 2004 - North by North-West: Contemporary Indigenous Art from the Queensland Art Gallery Collection, Queensland Art Gallery, Brisbane; EXPLAINED, A closer look at Aboriginal art, Aboriginal Art Museum, Utrecht, The Netherlands. 2003 - Raft Art Space, Darwin, NT. 2002-2005 - Native Title Business - Contemporary Indigenous Art, a national travelling exhibition. 1995 - Paintings by Warmun Women, Australian Girls Own Gallery, Kingston, ACT. 1994, Australian Heritage Commission National Aboriginal and Torres Strait Islander Art Award Exhibition, Old Parliament House, Canberra; Bush Women, Fremantle Arts Centre, Perth, Western Australia; Power of the Land, Masterpieces of Aboriginal Art, National Gallery of Victoria. 1993, Images of Power, Aboriginal Art of the Kimberley, National Gallery of Victoria, Melbourne. 1993 - The Tenth National Aboriginal Art Award Exhibition, Museum and Art Gallery of the Northern Territory, Darwin. 1992 - The Ninth National Aboriginal Art Award Exhibition, Museum and Art Gallery of the Northern Territory, Darwin. 1991 - Aboriginal Women Painters, Art Gallery of NSW [touring]; Eighth National Aboriginal Art Award Exhibition, Museum and Art Gallery of the Northern Territory, Darwin; Aboriginal Women's Exhibition, Art Gallery of New South Wales, Sydney. Edith Cowan University Collection Perth WA.